To be fair (which is not to say I’ve been unfair! ), part of this overall score is likely driven by the Uniform Bar Exam. It used to be that there were more test-takers who’d passed a previous bar exam and would have to take another test in another jurisdiction. Those who’d already passed were likely to score quite well on a second attempt on a new bar. But the National Conference of Bar Examiners has indicated that the rise of the UBE has dropped the number of people taking a second bar, which in turns drops the number of high scorers, which in turn drops the MBE scores. So the drop in the MBE scores itself isn’t entirely a cause of alarm. It’s a reflection that the UBE is reducing the number of bar test-takers by some small figure each year. We now know the mean scaled national February MBE score was 134.0, up 1.8 points from last year's 132.8. We would expect bar exam passing rates to rise in most jurisdictions. Just as repeaters caused most of the drop last time, they are causing most of the rise this time. Repeaters’ scores simply appear to be more volatile as a cohort of test takers. A couple of visualizations are below, long-term and short-term trends. For perspective, California's "cut score" is 144, Virginia's 140, Texas's 135, and New York's 133. The trend is more pronounced when looking at a more recent window of scores. The first major drop in bar exam scores was revealed to law schools in late fall 2014. That means the 2014-2015 applicant cycle, to the extent schools took heed of the warning, was a time for them to improve the quality of their incoming classes, leading to some expected improvement for the class graduating in May of 2018. But bar pass rates were historically low in July 2018. It’s not clear that law schools have properly adapted even after five years. Until then, we wait and see for the July 2019 exam. For more, see Karen Sloan over at NLJ. At the risk of offering a spurious correlation, I noticed that the average score appeared to rise and fall with the conditions of the legal education market. The easiest way to track that would be to look at the overall 1L incoming class size the year the survey was circulated. You can make a lot of correlations look good on two axes if you shape the two axes carefully enough. But there’s a good relationship between the two here. As the legal education market rose from 2006 to 2010 with increasingly large 1L class sizes, peer scores roughly trended upwards. As the market crashed through 2014, peer scores dropped. Now, the market has modestly improved—and peer scores have moved up much more quickly, perhaps reflecting optimism. All this is really just speculation about why peer scores would change, on average, more than 0.1 in a single decade, or why they’d move up and down. Intuitively, the fact that peer scores may improve as the legal academy feels better about the state of legal education, or worsen as it feels worse, seems to make sense. There are far better ways to investigate this claim, but this relationship struck me as noteworthy! Much has been said about the impending USNWR proposal to have a Hein-based citation ranking of law school faculties. I had some of my own thoughts here. But I wanted to focus on one of the most popular critiques, then move to gaming out how citations might look in a rankings system. Many have noted how Hein might undercount individual faculty citations, either accidentally (e.g., misspellings of names) or intentionally (e.g., exclusion of many peer-reviewed journals from their database), along with intentional exclusion of certain faculty (e.g., excluding a very highly-cited legal research & writing faculty member who is not tenured or tenure-track). The individual concerns are of concern, but not certainly for the reasons that they would tend to make the USNWR citation metrics less accurate. There are two reasons to be worried—non-random biases and law school administrative reactions—which I’ll get to in a moment. Suppose USNWR said it was going to do a ranking of all faculty by mean and median height of tenured and tenure-track faculty. “But wait,” you might protest, “my faculty just hired a terrific 5’0” scholar!” or, “we have this terrific 6’4” clinician who isn’t tenure-track!” All true. But, doesn’t every faculty have those problems? If so, then the methodology doesn’t have a particular weakness in measuring all the law schools as a whole against one another. Emphasis on weaknesses related to individuals inside or outside the rankings ought to wash out across schools. Ah, you say, but I have a different concern—that is, let’s say, our school has a high percentage of female faculty (much higher than the typical law school), and women tend to be shorter than men, so this ranking does skew against us. This is a real bias we should be concerned about. So let’s focus on this first problem. Suppose your schools has a cohort of clinical or legal research & writing faculty on the tenure track, and they have lesser (if any) writing obligations; many schools do not have such faculty on the tenure track. Now we can identifying a problem in some schools suffering by the methodology of these rankings. In the future, if (big if!) USNWR chooses to incorporate Hein citations into the rankings, it would likely do so by diminishing the value of the peer review score, which currently sits at a hefty 25% of the ranking and has been extraordinarily sticky. So it may be valuable to consider how citations relate to the peer score and what material differences we might observe. This is a remarkably incomplete portrait for a few reasons, not the lease of which the trendline would change once we add 130 schools with scores lower than about 210 to the matrix. But very roughly we can see that the trends roughly correlate between peer score and Sisk-Leiter score, with a few outliers—those outperforming peer score via Sisk-Leiter above the line, those underperforming below the line. But this is also an incomplete portrait for another reason. USNWR scales standardizes each score, which means they place the scores in relationship with one another before totalling them. That’s how they can add a figure like $80,000 of direct expenditures per student with a incoming class median LSAT score of 165. Done this way, we can see just how much impact changes (either natural improvement or attempts to manipulate the rankings) can have. This is emphatically the most important way to think about the change. 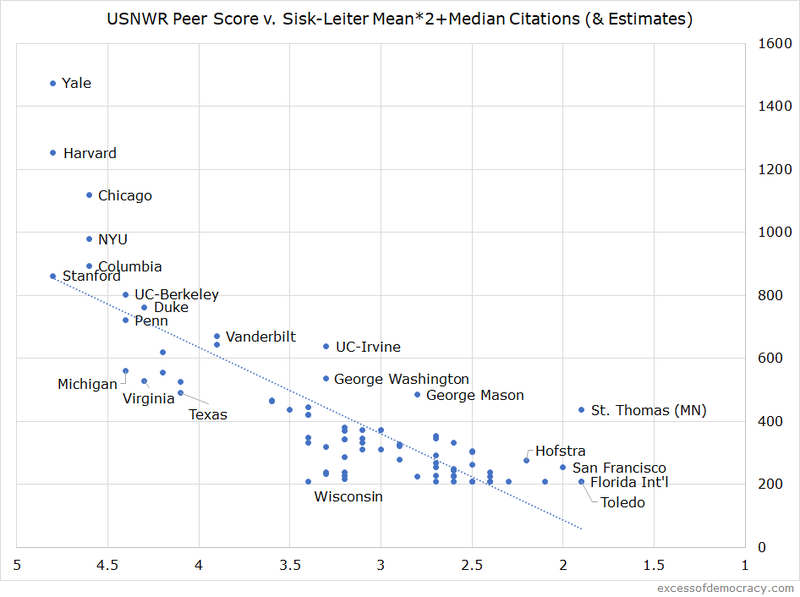 Law school deans that see that citations are a part of the rankings and reorient themselves accordingly may well be chasing after the wind if costly school-specific changes have, at best, a marginal relationship to improving one’s overall USNWR score. UPDATE: A careful and helpful reader pointed out that USNWR standardizes each score, but "rescales" only at the end. So the analysis below is simplified to take the standardized z-scores and rescaling them myself. This still allows us to make relative comparisons to each other, but it isn't the most precise way of thinking about the numerical impact at the end of the day. It makes it more readable--but less precise. Forgive me for my oversimplification and conflation! Let’s take a look at how scaling currently works with the USNWR peer scores. I took the peer review scores from the rankings released in March 2018 and scaled them on a 0-100 scale—the top score (4.8) became 100, and the bottom score (1.1) became 0. Yale’s 1474 becomes 100; the 75 I created for the bottom becomes 0. Note what happens here. Yale’s extraordinarily high citation count stretches out the field. That means lots of schools are crammed together near the bottom—consider Michigan (35), Northwestern (34), and Virginia (32). Two-thirds of schools are down in the bottom 10% of the scoring. If you’re looking to gain ground in the USNWR rankings, and assuming the Hein citation rankings look anything like the Sisk-Leiter citation rankings, “gaming” the citation rankings is a terrible way of doing it. A score of about 215 puts you around 11; a score of around 350 puts you at 20. That’s the kind of dramatic movement of a 0.5 peer score improvement. But let’s look at that 215 again. That’s about a 70 median citation count. Sisk-Leiter is over three years. So on a faculty of about 30, that’s about 700 faculty-wide citations per year. To get to 350, you’d need about a 90 median citation count, or increase to around 900 faculty-wide citations per year. Schools won’t be making marked improvements with the kinds of “gaming” strategies I outlined in an earlier post. They may do so through structural changes—hiring well-cited laterals and the like. But I am skeptical that any modest changes or gaming would have any impact. There will undoubtedly be some modest advantages for schools that dramatically outperform their peer scores, and some modest injury for a few schools that dramatically underperform. But for most schools, the effect will be marginal at best. That’s not do say that some schools will react inappropriately or with the wrong incentives to a new structure in the event that Hein citations are ultimately incorporated in the rankings. But one more perspective. Let’s plug these Sisk-Leiter models into a USNWR model. Let’s suppose instead of peer scores being 25% of the rankings, peer scores become just 15% of the rankings and “citation rankings” become 10% of the rankings. UPDATE: I have modified some of the figures in light of choosing to use the z-scores instead of adding the scaled components to each other. When we do this, just about every school loses points relative to the peer score model—recall in the chart above, a lot of schools are bunched up in the 60-100 band of peer scores, but almost none are in the 60-100 band for Sisk-Leiter. Yale pushes all the schools downward in the citation rankings. So, in a model of 15% peer score/10% citation rankings among the top 70 or so Sisk-Leiter schools, the typical school drops about 13 scaled points. That’s not important, however, for most of them—recall, they’re being compared to one another, so if most drop 17 points, then most should remain unchanged. And again, dropping 17 points is only 25% of the rankings—it’s really about a 4-point change in the overall rankings. 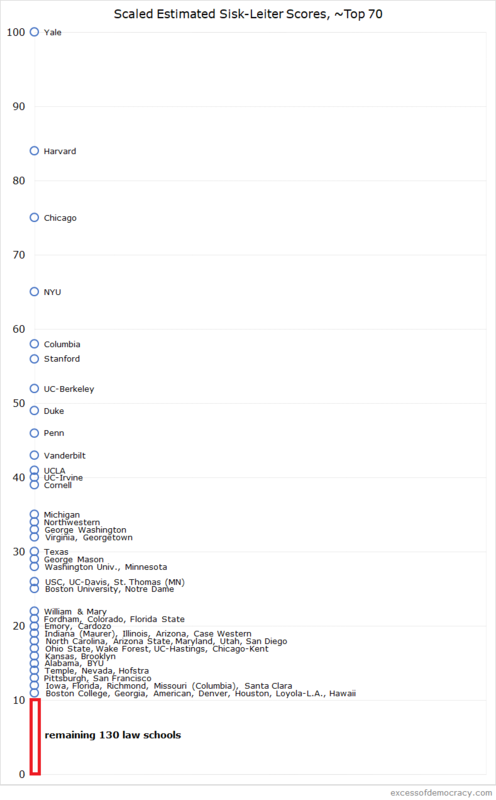 I then looked at the model to see which schools dropped 24 or more scaled points in this band (i.e., a material drop in score given that this only accounts for about 25% of the ranking): Boston College, Georgetown, Iowa, Michigan, Northwestern, Texas, Virginia, and Wisconsin. (More schools would likely fit this model once we had all 200 schools’ citation rankings. The University of Washington, for instance, would also probably be in this set.) But recall that for some of these schools—like Michigan and Northwestern—are already much higher than many other schools, so even dropping like this here would have little impact on the ordinal rankings of law school. I then looked at the model to see which schools dropped 10 points or fewer (or gained!) (i.e., a material improvement in score): Chicago, Drexel, Florida International, George Mason, Harvard, Hofstra, Irvine, San Francisco, St. Thomas (MN), Toledo, and Yale. Recall again, Yale cannot improve beyond #1, and Harvard and Chicago are, again, so high in the rankings that marginal relative improvements in this area are likely not going to affect the ordinal rankings. And all this means is that for the vast majority of schools, we’ll see little change—perhaps some randomness in rounding or year-to-year variations, but I don’t project for most schools much change at all. Someone with more sophistication than I could then try to game out how these fit into the overall rankings. But that’s enough gaming for now. We’ll wait to see how the USNWR Hein citation figures come out this year, then we might play with the figures to see how they might affect the rankings. 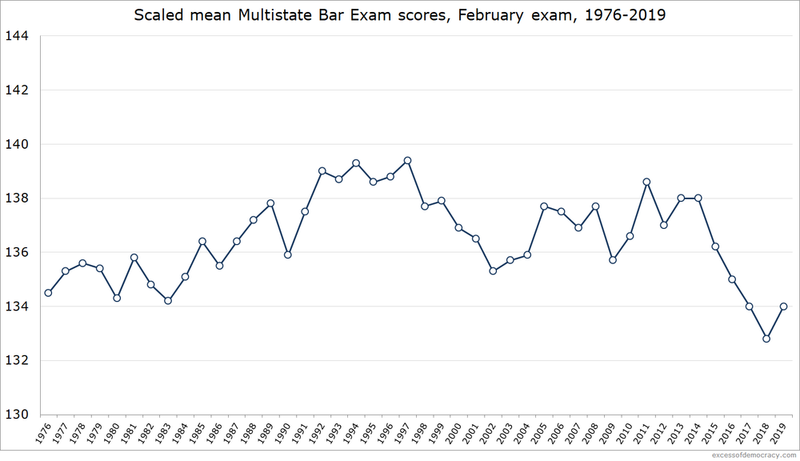 On the heels of some good news in recent administrations of the July bar exam comes tough news from the National Conference of Bar Examiners: the Multistate Bar Exam (MBE) scores have dropped to a 34-year low, their lowest point since 1984. For perspective, California's "cut score" is 144, Virginia 140, Texas 135, New York 133. A bar score of 139.5 is comparable to 2015 (139.9) in recent years. One would have to go back to the 80s to see comparable scores: 1982 (139.7), 1984 (139.2), & 1988 (139.8). I’d hoped that perhaps qualifications of students have rebounded a bit as schools improved their incoming classes a few years ago; perhaps students are putting more effort into the bar than previous years; or other factors. That appears to not be the case this year. That said, MBE scores may be slightly less predictive of what will happen with actual bar pass rates. the NCBE has pointed out that the rise of the Uniform Bar Exam has led to a number of test-takers transferring scores to new jurisdictions rather than taking a second jurisdiction’s bar—and, presumably, those who pass in one jurisdiction are much more likely to pass in another jurisdiction (accepting that cut scores can vary in some jurisdictions). The UBE points to a few thousand such transfers last year, at least some of whom may have taken the bar exam. But put against more than 40,000 MBE test-takers, the effect, while real, may be small. Instead, we’re left to watch as results come in state by state. Tracking first-time pass rates (from jurisdictions that share them so far—ideally, ABA graduates would be a better measure, but this works reasonably well for now), declines have been pretty consistent: New Mexico (-14 points), Indiana (-3), North Carolina (+1), Oklahoma (-8), Missouri (-7), Iowa (-3), Washington (-3), and Florida (-4). But in many of these jurisdiction, pass rates were worse in, say, 2015 or 2016. We’ll know more in the months to come, but it looks like another year of decline will cause some continued anguish in legal education. The increased quality of law school applicants this year will help the July 2021 bar exam look much better. Note: I chose a non-zero Y-axis to show relative performance. I've regularly posted judicial clerkship statistics on this blog. This year, I offer something slightly different: "Federal Judicial Clerkship Report of Recent Law School Gradates, 2018 Edition," a report I've posted on SSRN. This Report offers an analysis of the overall hiring of recent law school graduates into federal judicial clerkships between 2015-2017 for each law school. It includes an overall hiring report, regional reports, overall hiring trends, an elite hiring report, and trends concerning judicial vacancies. For these and more, check out the Report! This is the eighth and last in a series of visualizations on legal employment outcomes for the Class of 2017. Following posts on outcomes in Florida, Pennsylvania, Texas, New York, Illinois, Ohio, and DC-Maryland-Virginia, here is a visualization for legal employment outcomes of graduates of California law schools for the Class of 2017. (More about the methodology is available at the Florida post.) Last year's California post is here. While most markets remained fairly stagnant, California saw a marked rise year-over-year. total graduates dropped to 3910, a slight decline from 4081 in 2016 but a big decline from the 4403 in 2015 and 4731 in 2014. But the overall unfunded placement rate soared from 64.3% to 69.9%. That came from an increase in in bar passage-required jobs, from 2206 to 2397, as J.D.-advantage placement dropped. 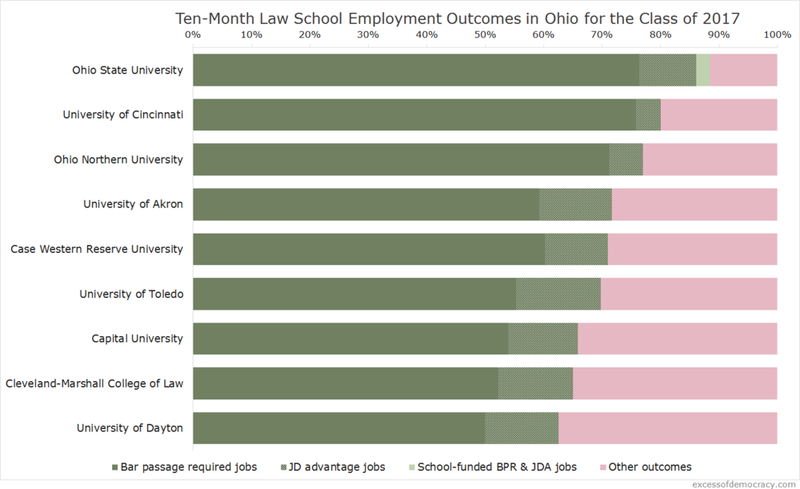 This is the seventh in a series of visualizations on legal employment outcomes for the Class of 2017. Following posts on outcomes in Florida, Pennsylvania, Texas, New York, Illinois, and Ohio, here is a visualization for legal employment outcomes of graduates of DC, Maryland, and Virginia law schools for the Class of 2017. (More about the methodology is available at the Florida post.) Last year's DC-Maryland-Virginia post is here. There were around 3410 graduates of law schools in the region, down from 3600 last year and 3740 for the Class of 2015, a 10% decline in just two years. Overall unfunded placement rose from 76.8% to 78.3%. Most of that growth came because of the declining number of graduates, but, as a positive improvement, J.D.-advantage placement dropped significantly as bar passage-required placement held steady. Georgetown continues its robust school-funded placement (40 jobs), well ahead of George Washington (9) & Virignia (8).